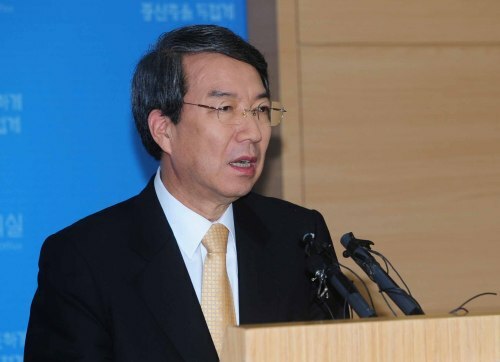 Prime Minister Chung Un-chan said he would step down in a press conference Thursday, a month after his mission to revise the Sejong City plan was rejected by the National Assembly. President Lee Myung-bak accepted the resignation as he plans to replace several Cabinet members early next month after his summer vacation. “With the by-elections wrapped up, I believe now is the opportunity for the president’s fresh start for the second half of his tenure,” Chung said. Chung, who took office last September, has led the government’s drive to scrap the relocation of government ministries to Sejong in South Chungcheong Province and instead develop it into a center of high-tech business and education. He visited the Chungcheong region 13 times during his 10 months in office in efforts to persuade the people to approve of the new blueprint. As an economist and former president of Seoul National University, Chung has said the original Sejong City plan to separate central government buildings in Sejong, two hours’ drive south of Seoul, was inefficient. The revision plan, however, was obstructed by all opposition parties including the Chungcheong-based Liberty Forward Party and even a faction led by Rep. Park Geun-hye within the ruling Grand National Party. Park had approved the relocation when she was chairperson of the GNP back in 2005 under the Roh Moo-hyun administration. “I feel remorse for not having prevented a waste of national resources and confusion,” Chung said. There have been media reports that Chung’s office was largely controlled by Park Young-joon, vice minister of the prime minister’s office and former presidential aide who is loyal to the president’s elder brother Rep. Lee Sang-deuk. Other than his key mission to push through an alternative for Sejong City, Chung had presented public education reform, raising birth rates, social integration, enhancing national standing and creating new jobs as this year’s main tasks. Ideas for public education reform stem from his education philosophy, widely respected due to his career as the chief of the nation’s most prestigious university, to diversify high school education, grant greater autonomy to universities and reduce discrimination based on schooling records. The prime minister was also appreciated for visiting the bereaved families of squatters and a policeman killed in a fire during at protests at a Yongsan redevelopment site in October and of the Japanese tourists killed in a fire in a Busan firing range in November.